Disclosure: I received a Bixbi Bike for review purposes. No other compensation was received. Though the product was free, opinions are 100% my very own. Regular readers of my blog know that I am a daredevil. I was climbing out of my crib by the time I was 12 months which made mommy decide that it was time for a toddler bed. I have had rocking horses that I thought would be fun to climb on and ride just like a cowboy would. When it comes to bikes I am a fan of balance bikes. They speak to my adventurous side. They also help with my sense of balance and my confidence as well. Not that I needed much more. I am a very confident toddler. 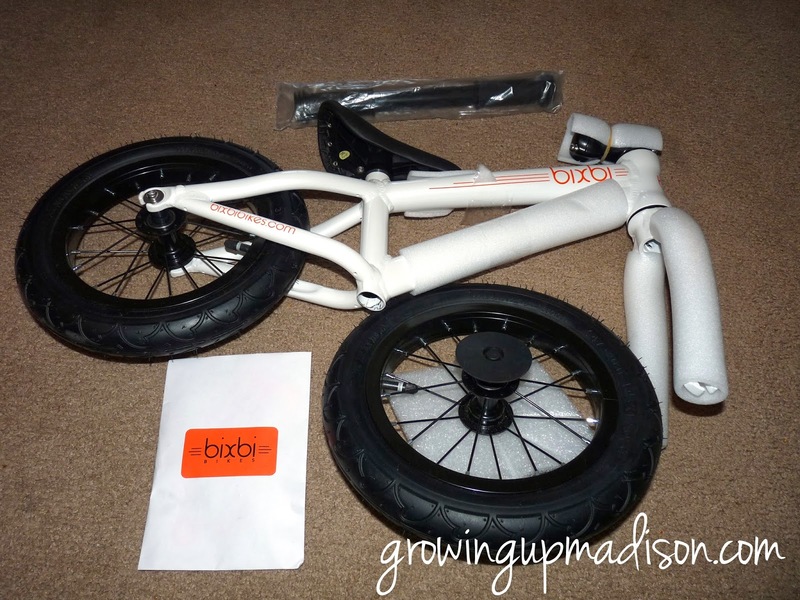 When given the chance to review a Bixbi Bike I couldn't possibly say no, could I? Here was another chance to show off my skills and I was only too happy to do just that. 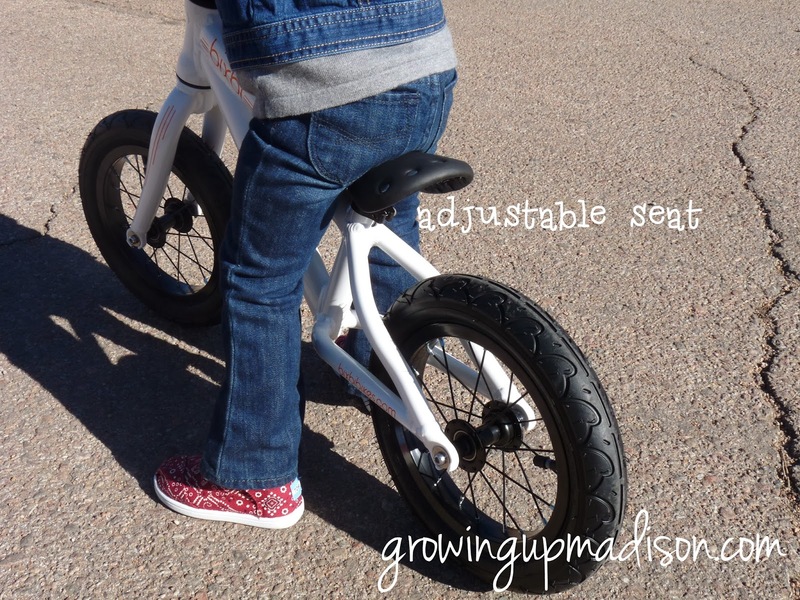 You may have seen my other reviews on other balance bikes but this one is very different. No two balance bike are the same. I have reviewed enough of them to tell that is the truth. They are all different and unique in their own way. What may work for you may not work for someone else. Everyone is looking for something different. While others may want a bike that is made of metal, someone might want one that is made of wood, while another may want one made of wood. If you're looking for plastic or wood then a Bixbi Bike is not for you. It also comes with a price tag of $225 but in my opinion it is totally worth it and I'll tell you why. Mommy and I were sent the Bixbi Bike Route 12 in Frost. Now don't let the packaging fool you. Sometimes the most beautiful things come in unassuming packages. Bixbi is one of those things. Weighing in at only 7.4lbs, the Bixbi is actually pretty lightweight, light enough for me to lift and take around the block. Now no mommy and daddy want to lift a tired little one and a bike that weighs 15lbs or more. I know mine wouldn’t want to do that. Bixbi although made of metal is almost as light as a feather. Set up was also pretty easy. Most of the bike was already fitted together and it took my dad about 15 minutes or maybe less to get it done. Instructions were illustrations but very easy to follow. Actually you didn't even need the instructions. That's how easy it was to do. Well according to daddy who didn't use them at all. All the tools required were already supplied and that was a alley key. No extra screwdrivers, pliers or wrenches. 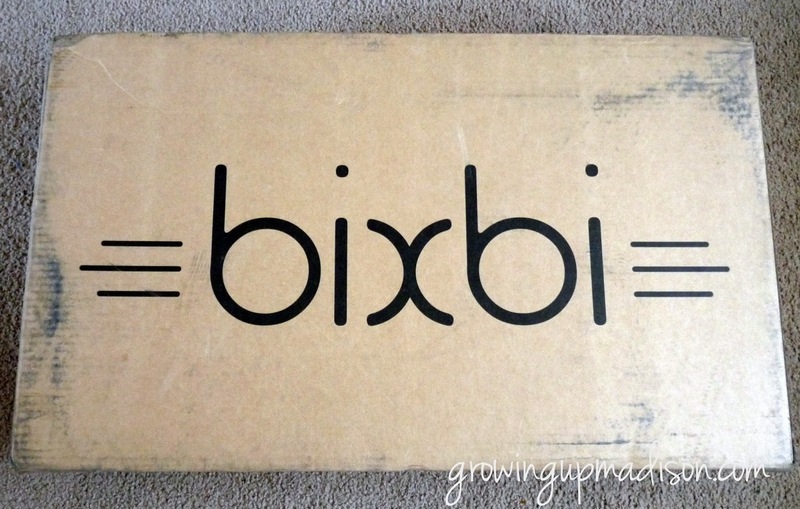 Bixbi sure made it easy to start riding practically straight out of the box. I couldn't wait to get on! Before I did Mommy had to take some photos to share showcasing some of the features of the Bixbi Route 12! Bixbi Bikes went all out when they designed their Route 12. This is certainly no ordinary balance bike. Just take a look at the seat. Bixbi decided on a very well padded leatherette seat that had metal rivets detailing. It was one of the things that drew my attention to my new Bixbi. Not everyone thinks of that minor detail. The seat is totally adjustable from 13.8" from the ground to 18.9". In my picture of me using it, it is at the lowest setting. I was still 23 months old in those photos and 35" tall. Bixbi Bikes truly wanted the Route 12 to be a miniature version of an adult bike. While others thought of foam wheels, Bixbi decided that they were going to let us enjoy the real thing. They went with rubber air tires on a metal rim, just like the adult bikes. Daddy did need to fill my tires with air before I was ready to ride. Luckily since I have older siblings I already had an air pump ready to use. Another thing that Bixbi thought of was customization as well. Mine isn't customized but for an extra $40 you can get your child's name, flowers or flames painted onto your bike truly making it unique. As if it wasn't unique enough. The paint job was superb and even looking at my own Bixbi which wasn't customized you can see that they did a great job. Bixbi bikes are currently available in Frost (which I own), Shadow and Tangerine colors. Check me out in that photo below. Notice the handlebars? They are perfect for little hands to wrap around. Not too wide or too narrow. Featuring an integrated thread-less headset, the Bixbi makes steering super easy for us little ones. And don't worry; I never ride without my helmet. This photo is only for demonstration purpose only. Now the only thing I would love to see on the new Bixbi is a kickstand so that we could keep them up instead of having them on the floor. I don't particularly like seeing my bikes with scratches and that would prevent most of that. Especially on the awesome paint job that the Bixbi Bikes sport. I am enjoying my new Bixbi Bike and can't recommend it enough. Recommended for ages 2 -5 years but can be used earlier than that as demonstrated by me. If you appreciate beauty and a classic design, complete with functionality then the Bixbi Bike is definitely for you. Bixbi Bike gets my TWO TINY THUMBS UP! Now check me out on a cruise on my new Bixbi. My husband and I have been searching for the perfect balance bike for our three year old. And your right there are so many and each on is unique in its own way! This bike sounds perfect for my little guy (who is also quite the little dare devil - very much not like his older brother!). I love that you can customize it too! Makes it the perfect present for our little guy! Sounds like a great balance bike. And Madison is definitely having fun with it. What a cute video :) The light weight isa plus for me also. She looks like she's having such a good time! I wish my bike could be that light, because after a ride I am exhausted, and do NOT want to put my bike in the garage loft. I like those handle bars, they are much better than the ones that curve in. This looks like a great first bike for my Grandson. Love the little pink knit hat you are wearing too. She is so cute on her bixbi. I love seeing her grow up. I've put a bike on layaway for my daughter she does ot and pt and it was recommend we get one of those special bikes but we can't afford one so I had found a similar bike and put it on layaway for my daughters birthday it;s in April and we plan on bike riding to school once the weather get's nicer. I would totally pay extra to get it customized :) I think a lightweight bike is easier to learn on I think, too. She is such a cutie patootie. I love that the seat is adjustable. This looks like an ideal bike for my youngest son to learn to balance on. Nice bike. My little one can use a little help when it comes to balancing. I should check this one out. This is a great looking bike, and I like knowing not all balance bikes are the same. Thank you for the great review!! That's really cute. I bet my six year old would love it! I love this! I was looking for one of these for just about forever, but I had no idea what they were called! I kept asking people if they had seen "those bikes with no peddles." I know you say they are recommended up to age 5, but I was told that if you put a child on one of these they won't need training wheels on their big-girl or big-boy bike. My son is turning 4 in a couple months and I'm really trying hard to decide whether to get this for him, or if I should just go all old-fashioned and get the bike with training wheels so I won't have to buy a whole new bike in a year. Hmmmmmmmmm any thoughts? Anyone? Anyone???? Great post by the way :) and I love the video! looks like it was easy enough to assemble and that she is loving it!! This looks like a really cute bike for kids who are just learning to ride. I like the fact that it is easy to assemble and that it is low to the ground which helps to keep kids from getting hurt. 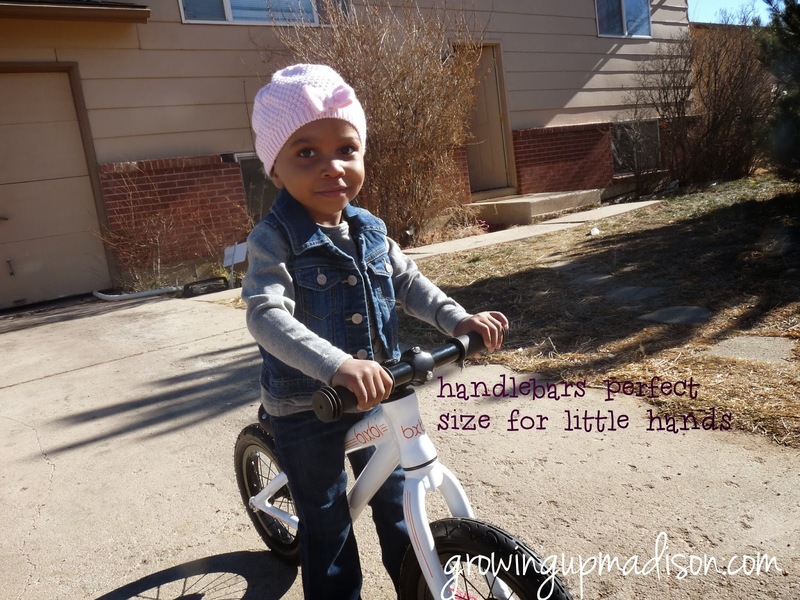 What a perfect bike for your little and cute rider. This makes me long for Summer time to come alrwady, it's frigid down here. My little granddaughter has one of these and she loves it - we got just in the beginning of the Fall so she had a chance to use it. Can;t wait for summer so she can use again. 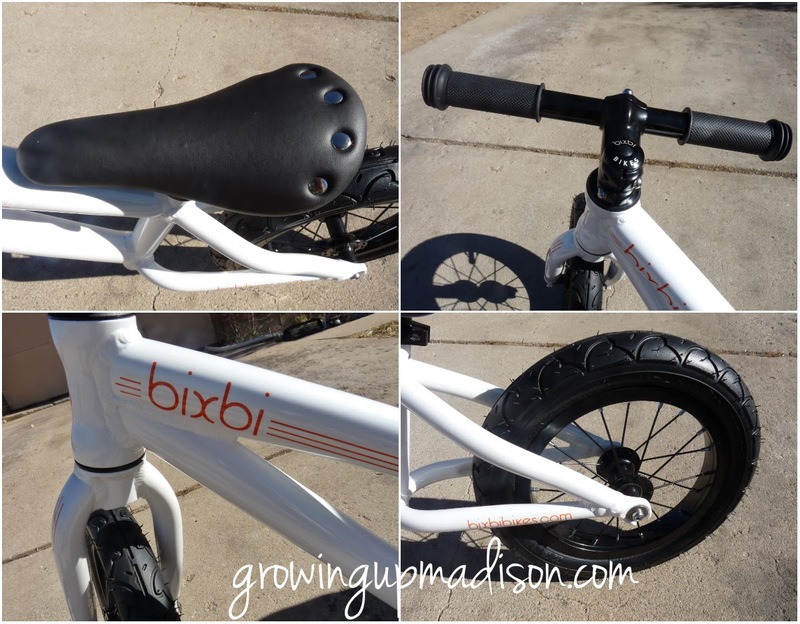 Madison, you are riding that bixbi bike like a real pro. I love that you can get it customized. I like the tangerine color one. You're the perfect cute little bike model! Such a fashionista! What a cute little daredevil!! My son is 8 and refuses to ride a bike. He'll ride anything else, but bikes freak him out. I feel like he is missing out on an integral part of his childhood. Maybe I should have started him earlier with a bike like this! I've never heard of balance bikes! Wow i feel so out of the loop but i absolutely love it! Thanx so much for sharing and putting the links to their website!!! Ohhh Madison gets the best review items all the time. :) What a great bike to get! She looks so happy and the bike looks really strong and of high quality. Wow, how do you get so many cool things to review-seriously! Looks like a cute little bike. I can never get my two boys to want bikes! I have tried and tried and they won't touch them :) This product looks great though, very cute! You look so proud, riding your new Bixbi bike, Madison! Serenity really likes your pretty helmet. As cold as it is right now, it'll be spring and bike-riding weather before we know it, and I'm going to check into Bixbi, I think. This sounds like a GREAT starter bike! my daughters 1 & 3 would love this like no other! 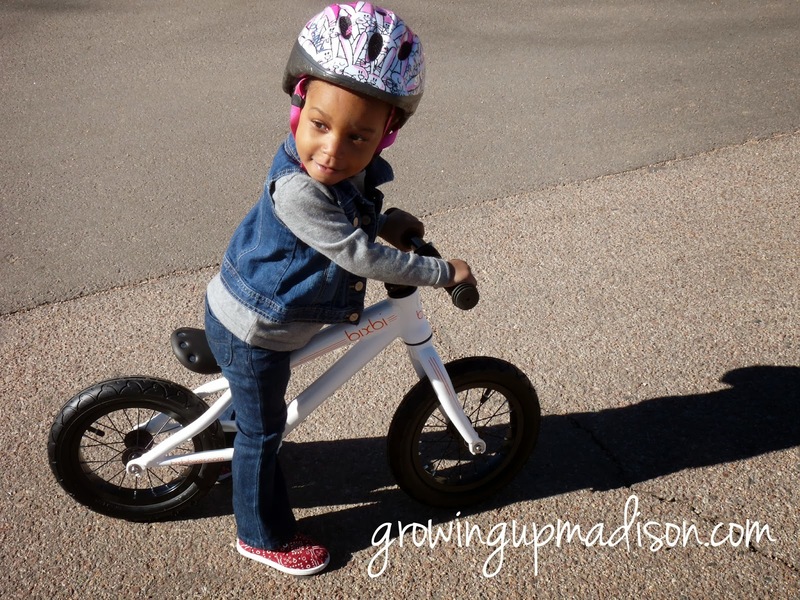 Such a cutie, Madison, on your Bixbi bike! You looked like you were having so much fun! Enjoy your bike! If your daddy is anything like my husband, then putting the bike together without using instructions must mean it is easy to assemble! We usually have some problems with assembly at our house. First - that bike comes in the greatest and easiest put together form ever. I like how it balances you just right. It’s exciting to have a bike made with you in mind. You never really know how much thought goes into making something safe and enjoyable for your playtime. What a great bike! She looks so cute on her new big girl bike wearing her safety gear. Great job! Davey started riding on a Balance Bike and it is amazing his sense of balance. He started riding a two wheeler with no training wheels before he was 4 - he is a excellent rider at 5. Everyone that knows us - are true believers of Balance Bikes! They saw Davey and are all impressed! In fact every friend we have with small children purchased a balance bike because of Davey. Looks like a great bike to learn to ride on. I like that you can customize it to the child's taste. Great review! I love the features of this bike. Great one to ride. I like the size, what a great way to learn how to ride a bike! I love these bikes. Balance bikes are the way to go. I've been meaning to start looking into balance bikes for my almost 3 year old, and this one looks like it'd be great for him. I love balance bikes! This one looks great. Coolest. Bike. EVER. Oh my goodness, she looks so cute riding it! That is an awesome bike! It looks very well made too and I love that you can customize it! My daughter who is the same age would love this too. What a fun bike. I'm sure you've got a happy little camper at your house! Good choice. In a way I understand why there's no kickstand but yet, I hear you with the not wanting to lay it down and get scratched. That is a cute bike and proportioned perfectly. Whoa, such a cool balance bike! I love that its so different than the rest, but that you can also ADD more custom features like a nameplate and stuff. How cool! I love your outfit & the little video you made too. Way cool review Madison!